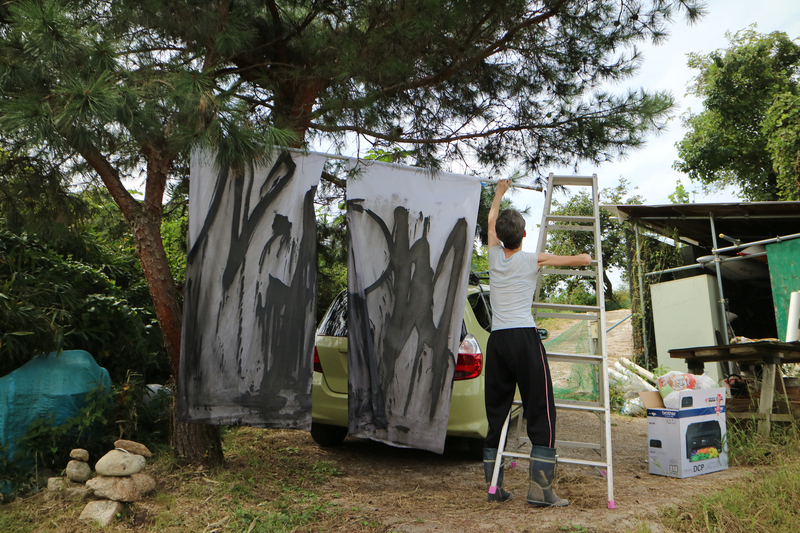 I am a British sumi ink artist living and working in Nara, Japan. Whenever I begin a painting I feel as if I’m in a void – as if there’s nothing under my feet. I tend to compound this fear by increasing the unpredictability of the painting process. At the start I pour, dribble or splash the sumi ink. I sometimes fold the paper itself and the initial outlines of the design are often done with a thin bamboo stick or torn pieces of paper. From this state of unknowing and lack of control I slowly build up patterns, textures, rhythms and washes to create a whole. My inspiration is the natural world and its patterns, energies and movements. By the time I finish, I have created a whole which I recognize – even though parts of it feel alien. The paintings are simultaneously ‘out there’ and of me. As a product of my interactions and experiences of the natural world they embody what I do not understand and can’t control and also what I do. Stylistically the paintings have ranged from impressionistic to completely abstract. Sumi ink is a versatile medium and allows for a wide variety of expressions, from deep black washes to delicate, dry line work. Papers and sumi ink vary tremendously, I have a few favourites but I often experiment with ones I don’t know. I also use script: English, Japanese phonetic script and Chinese characters. For me, text is another form of patterning. Living in Japan I am surrounded by a substantial amount of text I do not understand. It is foremost a visual impression and linguistic and cultural meanings come second. Recently I have been using texts to explore my relationship to the culture of Japan and my roots in Britain. The paintings are mounted in either East Asian or Western formats – vertical hanging scrolls, or panels and frames. I often work in series and I sometimes use hanging scrolls in sets of two or three. Besides painting, I make artwork in a variety of media: collages, small sculptural pieces, photography and moving images. 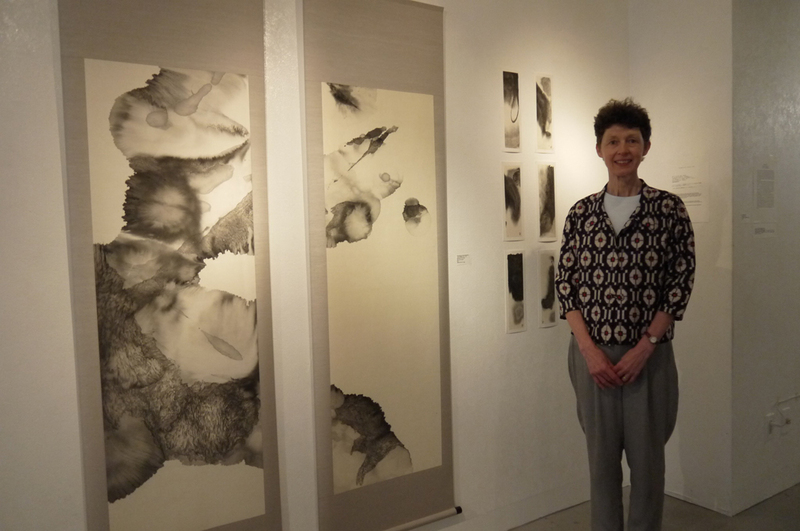 Parallel to my studio art, I research and write about the sumi ink arts. 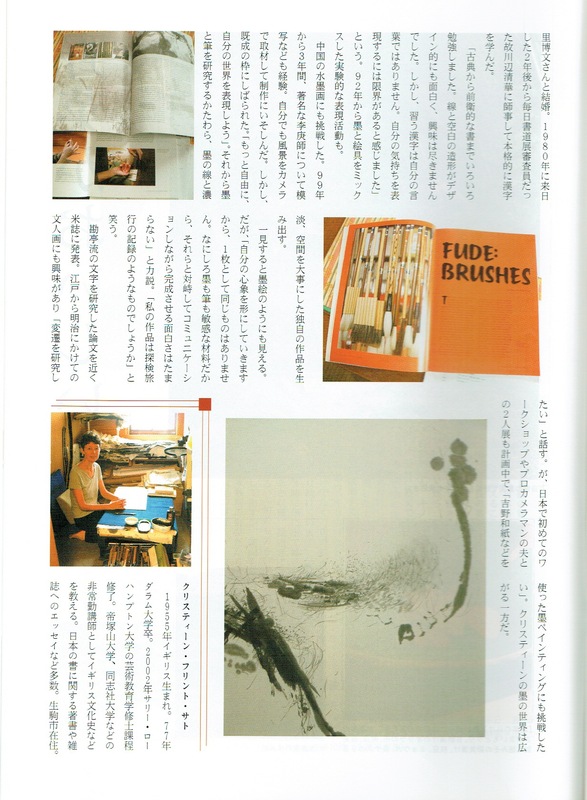 I published a book “Japanese Calligraphy: The Art of Line and Space” in 1999 and “Sumi Workbook” in 2014. I regularly write articles for culture and calligraphy magazines. Solo exhibition. La Pola, Osaka. ‘Responses’ The Small Mansion Arts Centre. London. Japan Festival 1991. Solo exhibition. Gallery Nakai, Kyoto. Solo exhibition. The Roof Garden, The Lyric Hammersmith, London. Solo exhibition. Kyoto International Community House. Kyoto. Solo exhibition. Osaka Contemporary Arts Centre. Osaka. Solo exhibition. 5th Space, Kyoto. Supported by the British Council. ‘Drawing Tea’. Six Women exhibition. Honen-in, Kyoto. Festival UK 98. ‘Ex-Isles’. Six Women exhibition. Daiwa Anglo-Japanese Foundation, London. 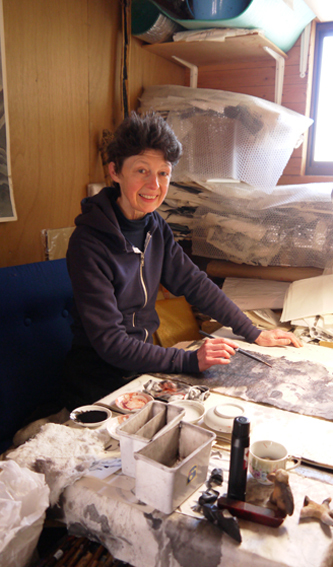 ‘What draws Us’ Five Women exhibition. Honen-in, Kyoto. ‘Revisiting the Tradition’ Two person exhibition with Hiro Sato, Art Promenade Nara 1300, Gofusha, Nara. Osaka Governor’s Prize in Calligraphy School Exhibition. International Cultural Association of Kyoto. Essay Prize. Alfred Plaut Co. Ltd., London. Design for stained glass window in St Philips and All Saints Church, North Sheen, London. ‘Land of the Waning Moon’ in ‘Essays on Japan III,1988-1992’ Kyoto Intl. Cultural Assoc., Bunrikaku Publ. ‘Japanese Calligraphy: The Art of Line and Space’. Osaka: Kaifusha Publ. Supported by grants from the Japan Foundation and the Daiwa Anglo-Japanese Foundation. 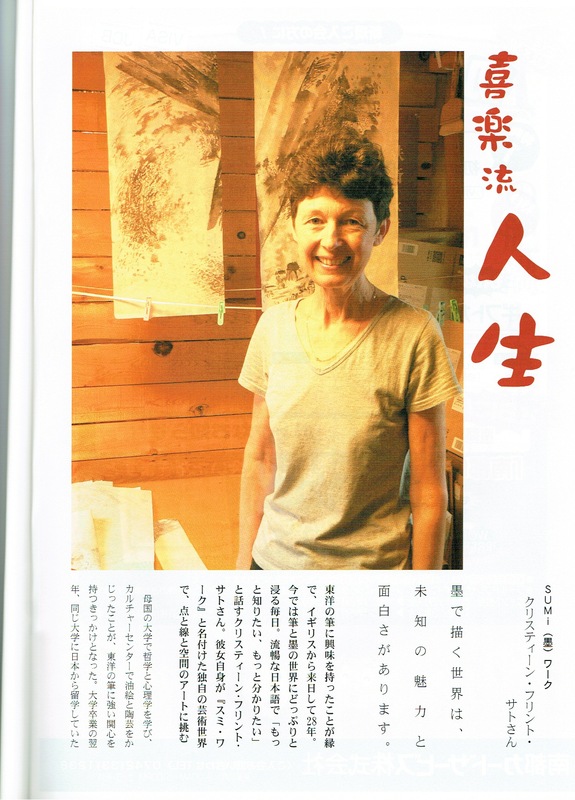 ‘Sumi’ in Letter Arts Review, Vol 18 #1. 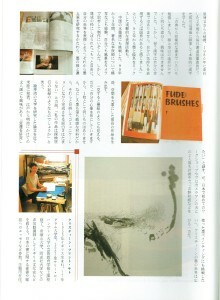 ‘Fude’ in Letter Arts Review, Vol 18 #4. Member of Women’s Art Association. Kyoto. Invited tutor ‘Breath, Spirit, Energy’ Writing Symposium, Sunderland, UK. 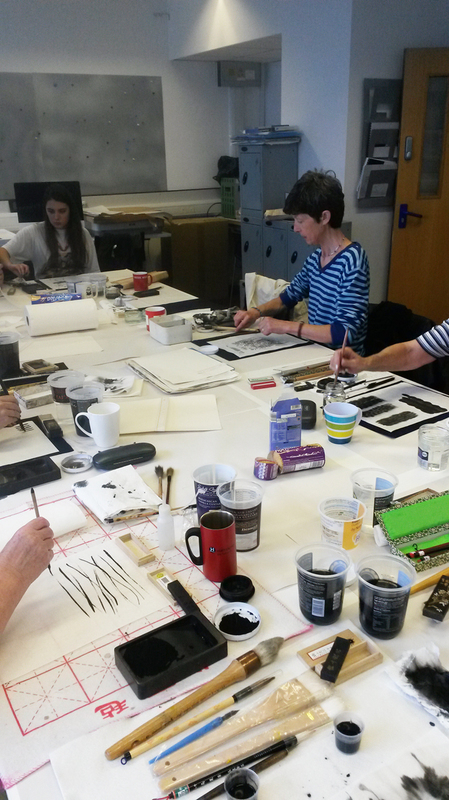 I hold sumi ink workshops regularly in the UK and Japan.